It happens every year and at the same time — once in a lifetime: otshumet prom, and in the hands of yesterday’s school children — the certificate of maturity, and the main exam is ahead: to find his place in life. First stone at the crossroads — the problem of choice of profession. And if you are not prepared for it, often the solution is incorrect. Do not put a deuce, but to pay for an error to occur. And, unfortunately, not the only one to graduate. Because if you add up the unopened unused potential talents with the formal terms of what we have to do, the result will be very disappointing. Where is the exit from the complicated labyrinth of contradictions, when there are thousands of applications of young SIP, but a faithful one? The guiding thread could serve as an early professional orientation. In most cases it will protect from rash steps that will help the proper selection and ultimately the harmony of interests of society and the individual. The word “profession” is somehow always linked to talent, but sometimes the profession chooses us, attracted irresistibly by a magnet. However, for this it is necessary to have in the soul something of the response — figuratively speaking compass that at all turns of fate invariably oriented in the selected direction. How does this “magnetism”! Some spontaneously, spontaneously, and we can only develop this sense, to give a “fulcrum” — practical application the vultures. Others, at first glance, there are distinct inclinations. In this case, it is necessary to find and to distinguish from the vast world of children’s interests some one, main, and painstakingly, persistently, in no way gently to help him get stronger. This is what sent all the various activities of extracurricular institutions. The Komsomol Central Committee, together with a number of organizations conducts all-Union review of their work on the 50-Petey assign the Komsomol and pioneer organization named after Lenin. One of the participants in this show — Ivanovo syut our story. Each of them can do their favorite thing. In the Ivanovo syut watching carefully the new models, and as a result, there are new mugs. So, in the current academic year, opened the doors of the laboratory by automakers, where students will develop the trace model, and the event in which the students have themselves to build a racing car. Any the longest journey starts with the first step. And the sooner it is made, the shorter the distance to the target. “Skillful hands” — the so-called club for the youngest. Gradually, step by step, from simple paper crafts to the finest woodwork children learn the alphabet wise of the world of things. Things, the main value of which is that they are made by hand. More than twenty years circle is headed by a Deputy Director syut Maria V. Nogovitsyn. In working with children, says Oka, we primarily use elements of the game. Inside the circle we organize exhibitions, celebrating the best homemade. The most important thing is to captivate the child classes, so it was interesting, and I definitely will be a success in the “needlework”. In addition, our goal is to teach thin, we can say, jewelry technique, mastery of the instrument. Toy — an essential companion of childhood, and we try, especially in the second stage of training, be made to the design elements of mechanics, you have to make it moving. It is like a preparatory step for practicing in other circles, where the student will meet with more complex models. We have no differences in the creativity of boys and girls. Young schoolgirl grasp of the tools along with the guys, and sometimes even better. Most of the members of the circle of “Skillful hands” remain faithful to syt and continue my training in technical laboratories. Many people come to the laboratory for aviation and rocket-space modeling. In the title it is felt imperative. But here, start with the simplest models and only good once you’ve mastered the basics, proceed to more complex structures. The club regularly participate in local, regional and national competitions. Recently three rank sportsman Valeriy Troshin, Vladimir Bakhtin and Viktor Vinogradov — with missiles “Hawk”, “K-2” and “3” won the championship of the Russian Federation silver medals. Fans of model making has its own well-equipped laboratory. 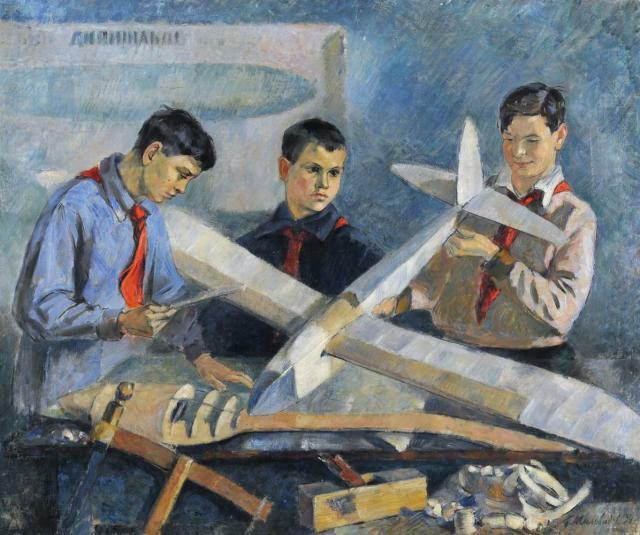 The boys build model boats and ships, yachts, catamarans, submarines, high-speed kordovye and RC design. Just to name a few. Just look at the Windows, where the glass has lined up a whole fleet of different vehicles. The students of 7-8 grades easily read sophisticated drawings, collect micro-motors. All this, of course, will be useful to them in the future. For many children’s hobby will be expensive to the profession. Characteristic of all circles of the station that they help each other. For example, the guys from radiokonstruktor lab doing remote controls and equipment for RC models. Amateurs organize exhibitions, movie Studio makes films about the competitions and film enthusiasts show these movies to all the guys and guests. And guests at the station is a lot. From all over the city come here students, for which syut regularly arranges excursions. Apply the mass, but nevertheless, the station tries not to deny anyone. The guys show their laboratory model, talk about the classroom. And not surprisingly, after this visit, many asked to take them to one of the circles. To attract teenagers at the beginning of each school year in all city schools distributed posters, which inform in detail about all the labs. In addition, each teacher syut secured certain school. At the beginning of the school year the station announced the recruitment in the section of the kart. From those who did not rebound. And it is quite clear: is it not tempting to build with their own hands racing car and then compete! The sphere of interests of the students is extremely diverse, but any of them will find the app. So, recently a laboratory HF and VHF. Teenagers with a passion for teaching Morse code, build radios and do get in touch with fans or clubs. So far, only on VHF band. But very soon will start to work through short-wave radio. It is especially necessary to distinguish a mug from a purely practical tasks. It is primarily a machine shop, where can I get real work profession: fitter, Turner, Miller. Shop makes the orders of all groups and is most closely associated with the production. In the factories Ivanova the guys from syut frequent and welcome guests. Here they show the workshops, familiarized with the working professions, tell how to make a particular item. These trips are not random. This is a mandatory form of work syut, and it is conducted strictly according to the plan agreed with the enterprises. Modern Ivanovo is not only the textile. A toiler city is constantly growing and has exceeded 400 thousand. On its territory lies the shops of the plant machinery, test devices, jib cranes, textile machinery and many others. The industrial look of the city constantly updated, and the station of young technicians trying to take into account the needs of industry in the preparation of a work shift. Station the teachers care about the worldwide spread of children’s technical creativity. With this aim, after the successful completion of a certain number of jobs for young equipment awarded the title of instructor-social work. It gives you the right to lead the technical group at the school. Summer students-trainers travel to summer camp and they organise circles of technical creativity. Heads of clubs are prepared in advance and carry the workpiece “semi”. The guys keen to build a model and then hold competitions, and, of course, winners don’t remain unrewarded. But most importantly, of course, not a reward. The main thing that hundreds of guys, back in town, hurry in technical circles, where you can try your hand, get a good labor skills, and, perhaps, will forever link their fate with their chosen profession. One of the great traditions of syt — promotion and organization of children’s technical creativity in the city and region. The heads of the station are constantly developing training materials, benefits for houses of pioneers and other extracurricular institutions of the region. The word “extracurricular” is somewhat too narrow, because Ivanovo syut, and others work in close collaboration with teachers and pioneer leaders. For them, regular seminars, where experienced mentors tell us how better and more productive to organize mugs and outline prospects for the development of children’s creativity. So, Ivanovo syut plans to organize a “textile club” where the students could build the looms, and then work on them. — This idea came to us long ago, — says M. V. Nogovitsyn, but, unfortunately, we just can’t find the head. Such a circle is vital to us, and it turns out really weird: Ivanovo — city, textile workers, and in addition to trips to the factory, we don’t IET the opportunity to inspire you guys a wonderful and important profession. — Our asset, says M. V. Nogovitsyn, has teachers of great help. Especially at the beginning. And, of course, are building complex models. Some of the current instructors — in the past pupils syut. For example, the head of the film Studio Alexei Mikhailovich sheep after army service returned to us. The fate and the Director of the syt Valentin Alexandrovich Yablokov. He was a Modeler, then a glider pilot. After the war, soon returns to the models, syut, and for more than two decades he is at the head of this team. His efforts and persistence owes much to the fate of the present suit. After all, when you’re just engineered building, Valentin took an active part in the layout of the premises, he oversaw the construction — in a word, the biography station, is inseparable from his own. V. A. Yablokov is well-known heads of industrial enterprises, workers of party and Soviet organs. From them he gets a big practical help. Work closely helps to expand technical creativity, so more and more inquisitive and curious fills out College and jobs. At all times valued craftsmen, and called them good master. From generation to generation, and carefully passed down the secrets. This hereditary tradition is most clearly expressed in the modern system of education for the younger generation’s technical literacy. Experienced mentors, sparing no effort, the LUT transmit knowledge to the young. And it will allow them to confidently enter into the life, meaning and purpose of which is creativity.